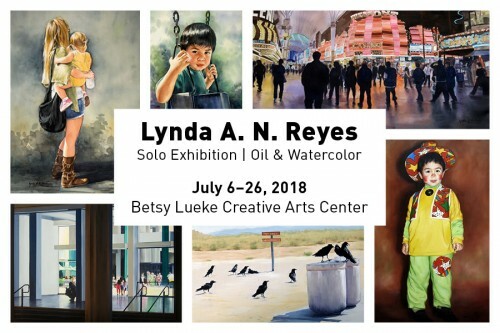 The Betsy Lueke Creative Arts Center Gallery, the municipal gallery of Burbank, is proud to present the Solo Exhibit of Glendale artist Lynda A. N. Reyes from July 6 to the 26th. The opening reception will be on Friday, July 6 from 7:00-9:00 p.m. The gallery is located at 1100 West Clarke Avenue, Burbank, CA 91506. The exhibit will highlight her watercolor and oil paintings that have been featured in museum exhibits in California, Wisconsin, Louisiana, Pennsylvania and Montana and in national juried shows in Berkeley, Los Angeles, San Francisco, Burbank, Sherman Oaks, Tarzana, Sta. Monica, Glendale, Brea in Orange County and in international shows in Kentucky, Canada, Maryland, Wisconsin, Colorado and New York. Paintings that have given her recognition, as well as new works will all be on view in one big venue. Lynda’s paintings are highly representational and yet they invite the viewers to ponder. Her paintings speak to all who see it. She says, “The subjects of my paintings ‘reach’ out of the two dimensional plane to make contact with the viewers. I aspire to create representational imagery that triggers a lasting smile, a longing to look and find a positive view of our world and of the people living in it. Through my art, I want to interact with my viewers and to share with them what I have experienced. When the viewers participate, only then can I say my painting is done! I believe that the appreciation of art is a very personal response to creative work and that as an artist I strive to engender this response in my viewers. My hands, mind and heart all work in unison to spark the awe the viewers experience in their initial encounter with any of my artworks”. Her scene paintings, whether big or small, are almost hypnotic. As the painting lures its viewers to a deep contemplation of the subject, the viewers unconsciously participate in the creative process. They relate to the scene depicted and at the same time imagine themselves participants in that scene. In the “Nocturnal Drifters” the brilliantly illuminated and heightened contrast of the colors made possible through the use of transparent watercolor, immediately capture ones attention. The viewers are lured to look closer as they find themselves in the midst of drifters during a late night stroll in Las Vegas. Similarly, in the oil painting “Rush Hour Jam”, the viewer is caught by a classic serenity of a 17th century landscape painting from a distance. But as the viewers are lured to look closer, they find themselves in a contemporary urban landscape that is very much part of anybody’s everyday encounter. Through heightened contrast of light and dark, drama and mystery are added to a seemingly mundane subject in her still life “Something’s Cooking”. One may think that the smoke comes from the pipe but the pipe is not lit. Where is it coming from? People fail to identify the source of tension and conflict because they refuse to see outside the boundary. Her participatory approach in her paintings is indeed effective. Lynda is a professional artist and maintains her studio and gallery in Glendale, California. The pursuit of fine arts has been her life-long aspiration. She is also an art historian, an author and has served as Juror for a national exhibit sponsored by the San Fernando Valley Arts and Cultural Center. A master watercolorist, her painting has been published in the book “Splash 14: Light and Color”. She has received awards for her oil and watercolor paintings. She has taught Art History at Glendale College, Santa Monica College, Pasadena City College, East LA College and Rio Hondo College. As a California Arts Council grant artist, she was a resource person for the visual arts for the Glendale Unified School District. Lynda is likewise known in the international academia for her book “The Textiles of Southern Philippines” and for her published studies in Philippine ethnic art. She received an International Fellowship Award from the American Association of University Women while pursuing her MA in Art History from Northern Illinois University. She received her Bachelor of Fine Arts major in painting degree in the Philippines. Visit www.lyndaanreyes.com or contact her at lyndaanreyes@gmail.com. For more information, visit www.burbankca.gov/cac or call 818-238-5397. © 2015 LyndaANReyes.com. All Rights Reserved.